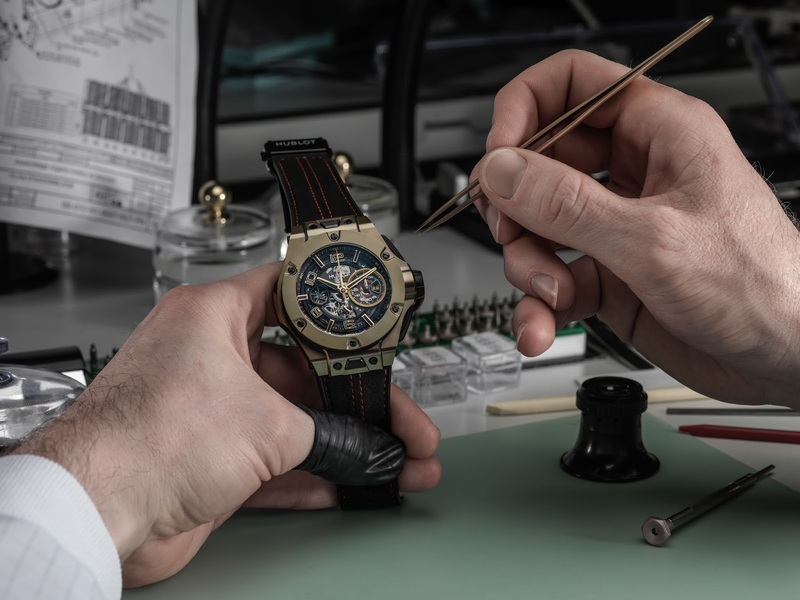 The connection between fine watches and racing cars is well-established. Many prestigious watchmakers have introduced watches whose designs were inspired by certain racing cars, drivers or events. 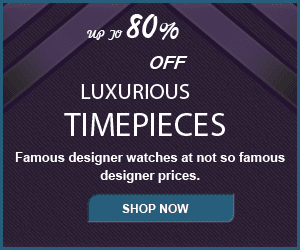 This affinity has given the world of fine watches some of its most popular and iconic creations. One such watch is the Big Bang Ferrari from Hublot. 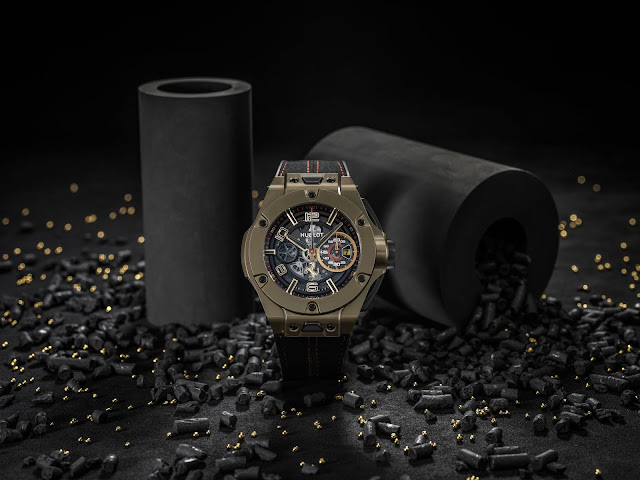 Created to commemorate an alliance between Hublot and the Ferrari auto company, this is a big, bold watch with a 45.5-millimeter diameter and all the flash and style of the prize-winning car manufacturer it represents. The first of these was the Big Bang Ferrari Titanium. Not content to rest on their laurels, Hublot has based an entire line of Big Bang watches on its racing-inspired prototype, taking the handsome design through several variations of color, materials, and features. Today the Big Bang line is one of the most revered lines in fine watchmaking, commanding respect from critics and the public alike. The Hublot Big Bang has a round, porthole-style face with a wide bezel secured by six H-shaped screws representing the Hublot name. The original design has a see-through face showing off the intricate movement, and while this model is still in production, later variations have used various face designs. Numerals and hour markers are very large and bold, giving the watch an emphatic, masculine appearance. The hands share the wide, oversized look of the numerals. Around the border of the face is a scale marked in five-second increments. In the basic design, a small seconds hand is located between the axis and the three. In chronograph models, a 30-minute sub-dial occupies this position while a 12-hour dial is in the lower dial and a quarter-second splitter is at the left. The chronograph buttons are angled and tapered, and there is no crown guard. The cases of the earlier models have a utilitarian, no-frills air with their visible screws and sharp lines. Angles are not rounded, giving the watches an undecorated look that will appeal to modern tastes. 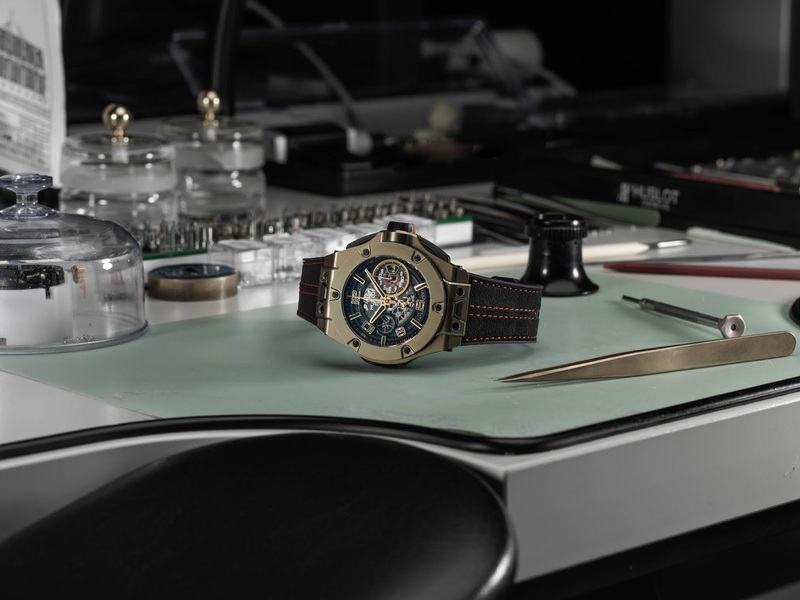 However, Hublot has bowed to the opulent tastes of some of its customers with the introduction of diamond models in the Big Bang line. Here the bezels are adorned with double rows of white baguette diamonds. In some models, the diamonds also appear on the lugs and bracelet. These models use yellow gold to highlight the color of the stones and create an appealing composition. These diamond models are all chronographs. Various materials have been used for the bezel and case. In the Big Bang Ceramic models, the bezel is polished ceramic with a bright, onyx-like sheen. The Big Bang Carbon has a case of carbon fiber. Some bands are stitched leather; others are silicone rubber. There are now Big Bang tourbillon models with visible tourbillons (gyroscopic balance devices) in the lower dial. As one of the most famous modern watches, the Big Bang has established a standard in the field. Purchasers will be getting one of the world’s finest watches and a piece of watchmaking history.